We fit Visonic Powermax complete Wireless Alarms. Replace Your Old Bell Box. Alarm Code Lost (Can get most codes back.) Depends on Make of Panel. 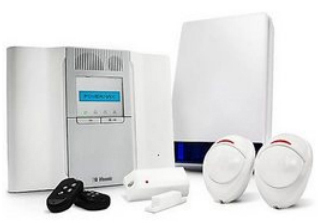 Alarm systems are a worthwhile investment in the protection of your home and family. Studies reveal that it is far less likely that you will become the victim of a burglary at home if you have a correctly fitted and well maintained burglar alarm. However, they should be regarded only as one element within a complete security package. The variety of alarms and their fitting is a complex subject. As a starting point the installation should meet with British Standard 4737/BS EN 50131. This type of installation refers to hard-wired systems as opposed to wire-free. Though more expensive than many wire-free or DIY packages on the market, they are more reliable and conform to the Association of Chief Police Officers Intruder Alarm Policy. The only wire free system which conforms both to British Standards and the ACPO Intruder Alarm Policy is a BS 6799 Class VI alarm. This type is typically more expensive than its hard-wired counterpart. Be aware that systems that claim to meet with British Standards, but don’t specify BS 4737/BS EN 50131 or 6799, may well be referring to the electrical standard and not that of the alarm system.